Networking giant Cisco has announced new Universal Power over Ethernet (UPOE) technology that offers up to 60 watts per port, significantly expanding the range of devices and services that can be operated by juice received over an Ethernet network, rather than by plugging into wall power or running off batteries. Common examples of devices you might want running off Ethernet power include thin clients for inventory management and sales, security systems, card and badge readers, IP turrets (think financial traders), and even gateways or additional switches. The idea is to reduce costs for both building out new facilities and operating existing services: when combined with Cisco’s EnergyWise power management software from Cisco, Ethernet-based power can provide centralized control so businesses can better manage their energy costs. The idea of running power over Ethernet isn’t anything new — Cisco itself helped pioneer the idea over a decade ago, rolling out switches that offered 7 watts of power per port. However, pushing the capability to 60 watts per port opens up significant new possibilities for the technology. 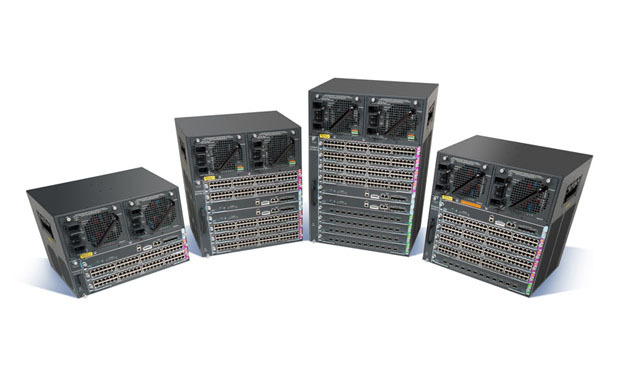 Initially available in Cisco’s Catalyst 4500E series switches (which Cisco will loudly trumpet are the most widely deployed switches in the world), the technology can handle up to 120 UPOE ports on a single chassis—and it runs over standard Cat-5 Ethernet cable, so no re-provisioning is necessary. Cisco partners Samsung and British Telecom already have gear ready that can leverage the new power capabilities, and Cisco says it will introduce a Power Over Ethernet splitter in September that will enable connection to third-party devices that operate off a standard DC input—which essentially means gizmos with a power brick or wall work. Suddenly, power over Ethernet could be driving cell phone chargers, notebooks, lights—even personal heating and cooling devices. Cisco’s technology is proprietary, but the company says it plans to open up the technology so other companies can ship UPOE devices, similar to the way the company offered its 802.3af and 802.3at standards for IP telephones and Wi-Fi access points.